El Poris i Tenerife, Spanien: Reservér nu! Welcome to El Poris! In our villa you will feel relaxed and comfortable like been in your home just with more new people. You will be free to share experiences, space and learn. The house is well designed to be welcoming people that want their own privacy too. We will have a maximum of 10 guests to ensure the best quality time and exclusivity! 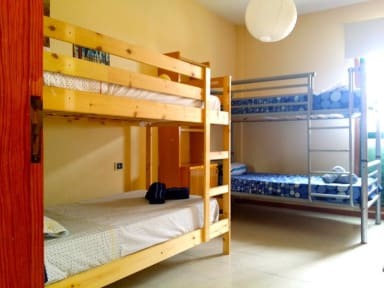 Our Hostel is the first of the island so close to a sandy beach, is located in the south of Tenerife, far only 15 minutes from south Airport, in the heart of a small fishing village. El Porís.In El Porís, typical Canarian population, you will find a supermarket (open every day), a Guardia Civil headquarters, a post office, a pharmacy, a bank as well as bars, restaurants and other small businesses. Do not forget to visit the“farmer’s market” open every Sundays morning with organic fruits and vegetables and local handicrafts. 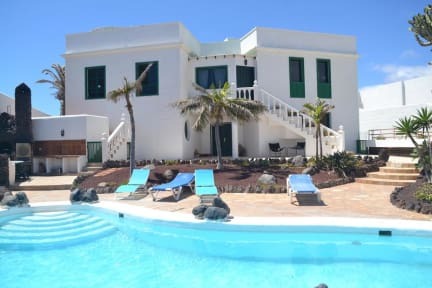 The Hostel, a spacious Canarian style Villa, is located 50 meters from the sea and offers many services: free WiFi, DVD, 3D Smart TV, movies and surf movies, 6 rooms, 4 bathrooms, 2 kitchens, a large chill out living room, a pool with waterfall, 2 BBQs, a large garden, 1 outdoor shower, a solarium, fishing rods, equipment for training, a pool table, a wine cellar and much more!